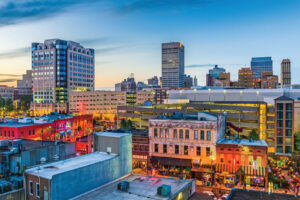 Memphis is well known as the city of jazz, blues, and barbecue. If you’re on your way there soon, it might be difficult to know where to go and what to see (or taste)! Thankfully, I’ve curated a helpful guide with some of the top-rated hotspots that you need to visit if you’re in town. Just nine miles from downtown is Elvis’s historic mansion: a Colonial Revival-style, twenty-three-room home. Elvis bought Graceland in 1957 to move out of the city limits and stop annoying his neighbors with the flocks of fans who would congregate in front of his house. After his death, Graceland became a memorial to his life. It opened to the public in 1982. You can visit his grave there, along with his iconic pink Cadillac. Graceland is the second most visited home in the U.S., just after the White House. Built in 1919, The Arcade is the oldest surviving restaurant in Memphis. It was established by Speros Zepatos, who immigrated to Memphis from Greece. In the 1950s, his son Harry gave the building a classic 50’s makeover and turned it into the hopping diner it is today. The restaurant serves up southern-style breakfast and lunch daily and is open late on the weekends. The Arcade has quite a reputation, too: Elvis used to be a regular, and you can even request to sit in the “Elvis Booth” while you eat your eggs and grits. The Arcade has also been used as a film location in The Client, Elizabethtown, Walk the Line, and The Firm (among others)! Look for the “Modern Movie Making in Memphis” plaque outside denoting its big screen fame. While The Arcade sounds like it would be… well, an arcade? Obviously it isn’t. But Rec Room is! It’s actually what kids these days are calling a barcade. One of their mottos is “high scores and generous pours.” You can pop in and play a round of pinball while you sip on your favorite beer. They have a generous number of rotating classic arcade games like Donkey Kong, Burger Time, and Mortal Kombat. You can also play air hockey, Skeeball, or ping pong, as well as select from a variety of Xbox games. If you get hungry, they serve pizza on site and usually have a brigade of food trucks coming in and out that serve sundry local fares. Did you really go to Memphis if you didn’t visit Beale Street? It was declared the “home of the blues” by Congress in 1977 and has seen such heavy hitters as Louis Armstrong, Albert King, Muddy Waters, Memphis Minnie, and B.B. King. 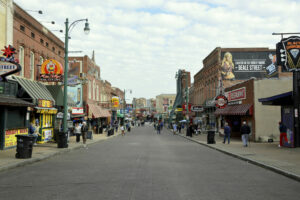 Today, it’s on the National Register of Historic Places, and if you’re looking for something to do, there’s a place for everyone on Beale Street. 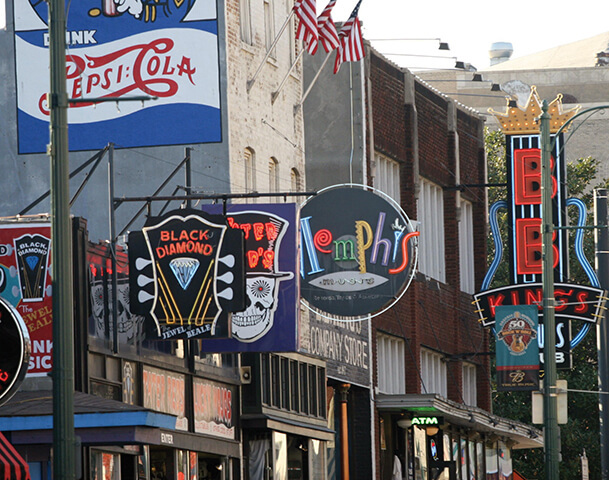 Check out the Memphis Rock ‘n’ Soul Museum, curated by the Smithsonian, or stop into B.B. King’s Blues Club for a bite and a boogie. You can visit A. Schwab, a mom and pop dry goods store which is the only remaining original business on Beale Street, or treat yourself to one of Dyer’s burgers. Dyer’s has been dishing up hamburgers cooked in their famous “secret grease” since 1912. For any informed citizen, a stop at the National Civil Rights Museum (NCRM) is a must. The museum is built around the Lorraine Motel, the site of the assassination of Dr. Martin Luther King, Jr., which happened on April 4, 1968. The complex takes visitors through a series of interactive and evocative exhibits that map out the story and struggle of the civil rights movement. The NCRM has a series of changing gallery exhibitions as well as a repertoire of permanent exhibits, including one honoring Rosa Parks and the Montgomery Bus Boycott and another called “Standing Up by Sitting Down,” which includes an original lunch counter from the student sit-ins in Greensboro. One of the most famous and moving permanent exhibits at the NCRM is Room 306, where Dr. King was staying the night he was killed. Everything in the room is exactly as it was that night—stopped in time. 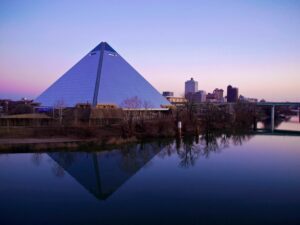 The Pyramid is an iconic Memphis landmark. Built in 1991, it’s a sixty percent replica of the Great Pyramid of Giza. While it was originally intended to be an arena for sports and other crowd-drawing events, it currently houses, most famously, a Bass Pro Shops superstore. But there are lots of things to see and do at The Pyramid! Aside from being a fabulous photo op spot, inside there’s an archery range, a laser arcade, and a bowling alley that’s also an aquarium. If you’re into heights, you can dine at The Lookout, which is at the very top of The Pyramid. A twenty-eight story elevator ride (the country’s tallest freestanding elevator) will take you to the observation deck, where you can take in a 360-degree view of the city before noshing on salmon or ribeye. You can even stay in The Pyramid if you like. The Big Cypress Lodge, a 100-room hotel, sits in the base of this Memphis icon.